Mahugh Fire & Safety is a distributor for ANSUL, Badger, Pyrochem, Amerex and Kidde fire suppression systems. We have been trained and certified by these manufacturers to install and service their products. Our systems are considered top of the line and are the names best known in the industry. Whether you have a restaurant kitchen , a paint booth or some other area that needs fire protection, Mahugh Fire can install and service your suppression systems. For restaurant owners, their kitchen is the heartbeat of their livelihood. It’s where their greatest chefs labor away and where the delicious food that keeps customers coming back time and time again is created. But where there is heat, there is the risk of fire. Fires are more likely to occur in a restaurant than nearly any other kind of business. With continual exposure to high heat, fires can break out for a variety of reasons. Regardless of why a fire starts out, what is important is suppressing the fire as quickly as possible. Water typically is not an option, as grease fires spread with the inclusion of water, while extinguishers may ruin all of the food and produce inside of the kitchen when unnecessary. Restaurant fire suppression systems offer a unique way of putting out a fire quickly and efficiently. If you are currently on the market for a suppression system, or are interested in the restaurant business and want to know how best to protect your financial investment, the best restaurant fire suppression systems give you this capability. Mahugh Fire and Safety can assist you with making the right choice of restaurant fire suppression systems for your application. Our product offering includes all of the major systems in today’s market. We appreciate the opportunity to design, install, service, and test & inspect your system. In the event you have a discharge, Mahugh Fire will recharge your system, so that you are able to resume business with minimal interruption. Please contact Mahugh Fire for more information. Emergency service available 24 hours a day, 7 days a week. According to the National Restaurant Association, 57% of all restaurant fires involve cooking equipment. This means the fire can be contained if you have a suppression system installed. Properly training your staff, cleaning up grease, and having a fire extinguisher readily available when fire breaks out in other conditions is still important, but you can cut down your fire potential by nearly 60%. 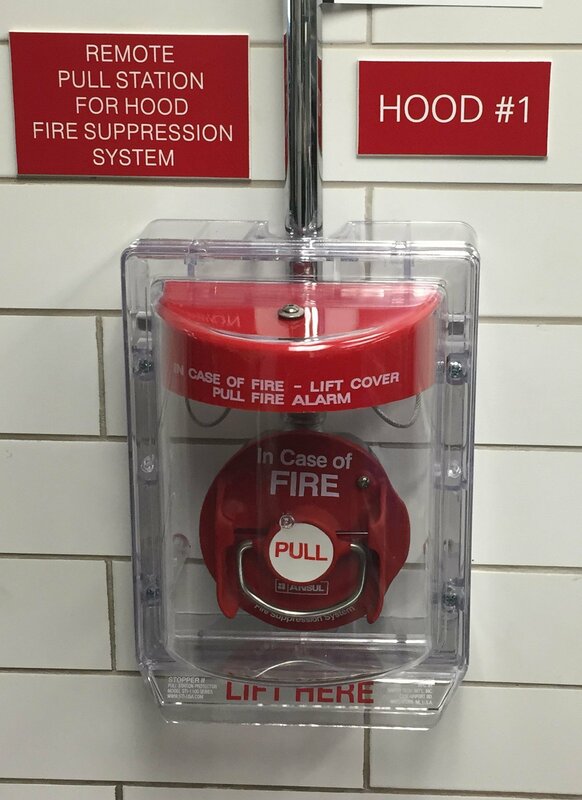 Therefore, fire suppression system instantly becomes your first line of defense. You just need to know more about it and how it works. Different brands provide slightly different features. For the most part though, a suppression system will provide you with the typical basic features. The suppression system connects to both the hood over your cooking station and the gas line running through the cooking station. If the fire suppression system is tripped, the gas line automatically shuts off. This kills the fuel source of the fire. Now, depending on the fire (such as a grease fire), it may still burn on and threaten to spread. Due to this, there is a secondary element to the system, designed to put out the remaining flames. Nozzles are installed through the ventilation system in the hood over your cooking station. When tripped, the nozzles discharge a specially designed fire suppressant. The suppressant is a water based chemical with a special compound designed to combat grease fires. As the extinguished fire creates a considerable amount of smoke, the hood kicks on, removing the smoke from the kitchen. Restaurant fire suppression systems are generally easy to use. Much like the sprinkler system running through professional buildings, the suppression kicks on when it detects flames and growing heat. Different systems do have different ways of detecting a fire, so be sure to look into this when discussing the installation. Once tripped, the two-prong approach kicks in quickly to kill the fuel source while dousing the flames. This keeps potential financial loss to a minimum, with only the food on the cooking surface destroyed. Manual activation should come as an option. As is the case of fires when a sprinkler system is present, if the designated trigger is not activated, the nozzle system may not turn on until the fire has spread beyond the cooking surface. To prevent this from happening, a manual activation point on the restaurant fire suppression systems allows an operator to turn on suppression, killing the flames quickly. When is a Fire Suppression System Necessary? Not all restaurants have a fire suppression system. When is it necessary to have such a system installed? In any commercial kitchen, it does not matter the location, it is a safety precaution. From a football stadium to fast food kitchens and really anywhere else in between, kitchen fires can quickly burn out of control. With most fires starting on the cooking surface, having a system in place that kills the fire without shutting down the kitchen allows staff members to clean up and get back to work, without customers ever knowing of the situation in the kitchen. Suppression systems come in many different size variants. Such a system is usually installed into the current hood of a kitchen. This gives the installation service providers the ability to adjust the size of the system and the amount of liquid fire suppressant readily available. While no two restaurants are exactly alike, most kitchens share similar traits, so having this kind of setup installed is not difficult and can be customized to fit the restaurant’s needs. Employee safety is a priority for any employer. As a business owner, it is your job to provide the best product in the safest manner possible. Restaurant fire suppression systems allow you to do just that, while protecting your financial and real estate investments from fire damage.